Do you have mischievous children? We at Dodgy Perth have the solution. 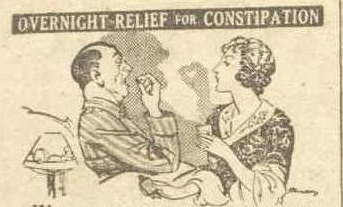 Adverts in the press in 1907 informed you that naughtiness is usually caused by a “disordered stomach”. The good parent will automatically dose the kid up with loads of Chamberlain’s Tablets. That is to say, a good parent plies their misbehaving child with laxatives. Laxatives. Apparently you will be delighted with the results. Should you require any laxatives to make your child into a little angel, just ask your local chemist for the appropriate dose. ← Previous Post Is there a worse city than this?